Purple Membership has been designed for organisations wanting to kick start their disability journey. It provides access to Purple’s digital diagnosis service, our guide to Disability Confident and an ability to promote your disability commitments to your employees and customers. Purple membership is a cost-effective way to determine whether Purple is right for you. 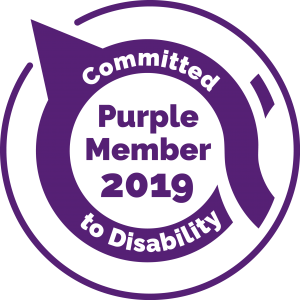 By becoming a Purple Member, you will join a network of like-minded organisations who are committed to improving and promoting their organisations commitment to disability. All Purple members receive a monthly e-bulletin, business magazine, discounts on training and an exclusive Purple Member logo for use on their promotional material. Join us now and be part of changing the conversation on disability. Download our Purple Membership Information Pack to find out more. Purple see the world differently. You can too.